1 : 1020000 Johnson, A.J. 1 : 323000 Morris, William E.
1 : 995000 Johnson, A.J. Map of Pennsylvania / constructed from the county surveys authorized by the state, and other original documents ; revised and improved under the supervision of Wm. E. Morris, civil engineer, upon data procured in each county ; engraved by Edwd. Yeager. Schonberg's Map of Pennsylvania, New Jersey, Maryland and Delaware. Map of Pennsylvania, New Jersey, and Delaware. Map Of Pennsylvania New Jersey And Delaware. Map of New Jersey And Pennsylvania. 1 : 1300000 Buchon, J. A. C.; Carey, H. C.; Lea, I.
Pa. Md. N.J. & Del. 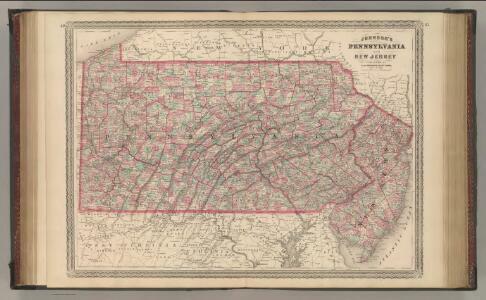 1 : 1120000 Tanner, Henry S.
County Map Of Pennsylvania, New Jersey, Maryland, And Delaware. Map of Pennsylvania and New Jersey / by H.S. Tanner; engraved by H.S. Tanner & assistants. Map Of Pennsylvania And New Jersey.